During a recent Q&A session at Rock Fantasy Camp, Alice in Chains’ Jerry Cantrell revealed that Layne Staley encouraged him to take on a more active role in singing lead vocals. As Alice in Chains began to take charge of the ’90s alternative rock scene, the Seattle group dwelled further and further on their two-man vocal attack, conjuring some of rock’s most beautiful and unnerving harmonies. 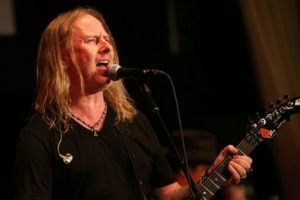 Alice in Chains are currently in the studio working on the follow up to their 2013 LP, The Devil Put Dinosaurs Here, which debuted at number two on the Billboard charts. Earlier this year, Cantrell released a new solo song, “A Job to Do,” for the Keanu Reeves film John Wick: Chapter 2.